The Virginia Glee Club has a long history with the celebration of Founder’s Day, the anniversary of the birth of Thomas Jefferson, founder of the University of Virginia. While the Glee Club does not dress up in purple robes for dawn rituals (at least, not that we’re aware of), the group has been associated with the holiday for decades, and some of the Club’s most significant moments date to Founder’s Day celebrations. A few examples are below. 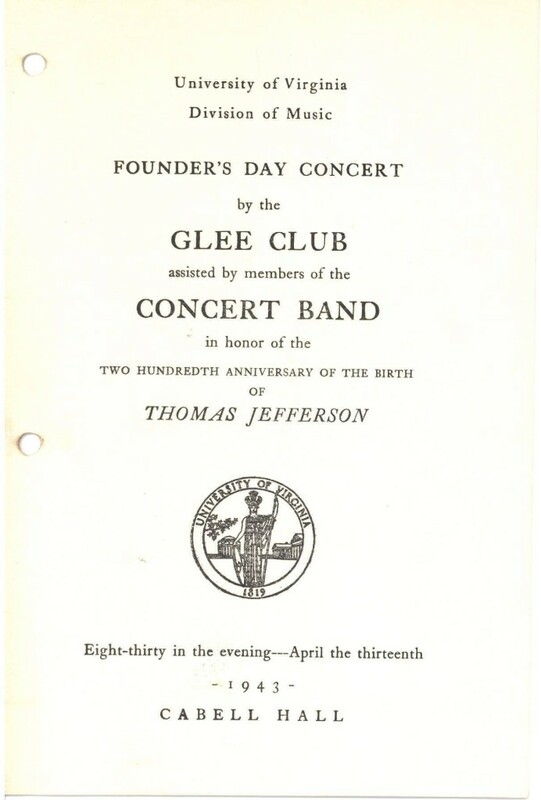 The 1943 Founder’s Day concert was one of the Glee Club’s earliest Founder’s Day triumphs. The Club’s 1930s impresario, Harry Rogers Pratt, had resigned as director in 1942 to contribute to the war effort, and Randall Thompson, the head of the music department, had stepped in. He also brought along one of his young professors, Stephen Tuttle, who would become the permanent director of the Glee Club in 1943. Thompson was approached by the president of the University, John Lloyd Newcomb, to write a work for the celebration of Jefferson’s birthday. He responded with The Testament of Freedom, which set passages of Jefferson’s writing to music for men’s chorus and orchestra, and dedicated it to the Virginia Glee Club. The first performance was recorded by CBS for nationwide broadcast, since the work’s text provided an uplifting message of patriotism and resolve, and it was subsequently transmitted over shortwave to Allied servicemen stationed in Europe. The Testament continued to be an important part of the Glee Club’s repertoire—it appears on 1972’s A Shadow’s on the Sundial—and reappeared with some frequency at Founder’s Day concerts. 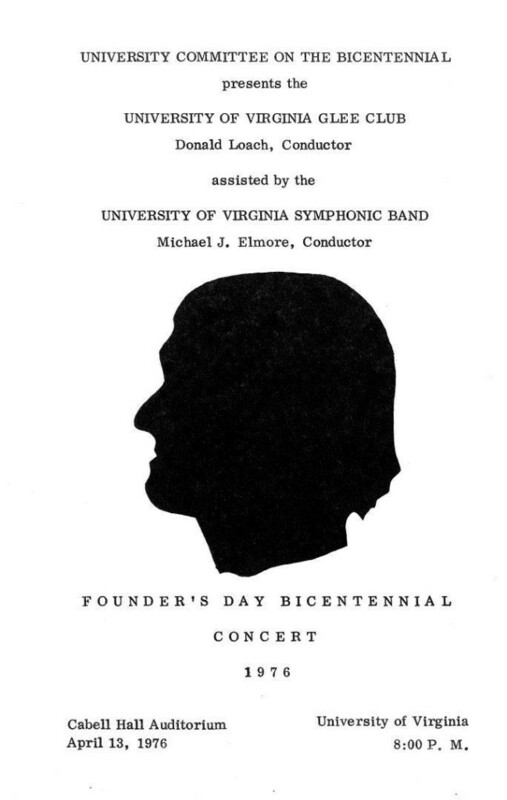 One such occurrence was in 1976, when Club performed the work at the University on the Bicentennial Founder’s Day alongside Elliott Carter’s “Emblems.” This wasn’t the first time the group performed the work; they had previously sung it with the Norfolk Symphony and at the Kennedy Center. By 1981, the Glee Club had undertaken three international tours in less than a decade and was starting to see the necessity of establishing a fund to support members who could not afford to pay their own way. 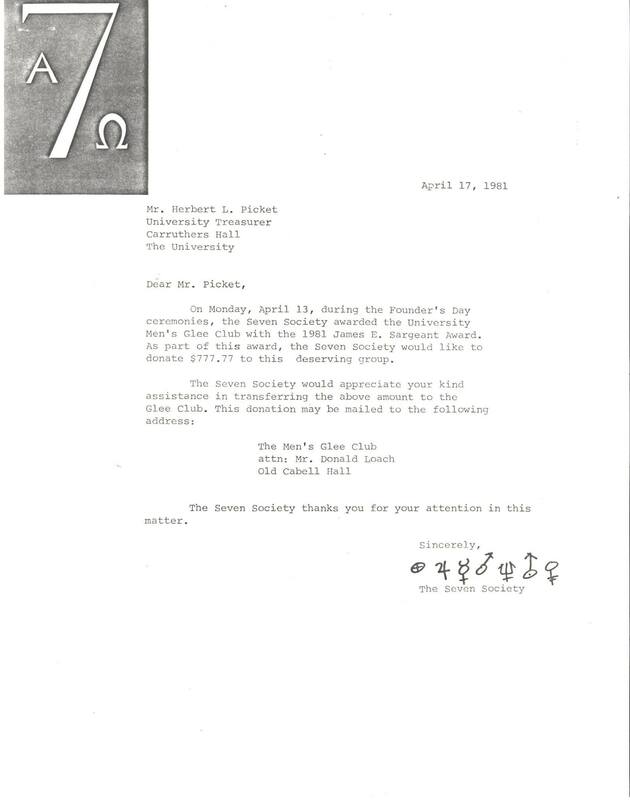 In the late 1970s the Glee Club endowment had been established to support touring activities, and it received a boost in 1981 when the Seven Society, following their award of the James E. Sargeant Award to the Glee Club (given for organizations who made outstanding contributions to the University), made a donation to the fund of $777.77. 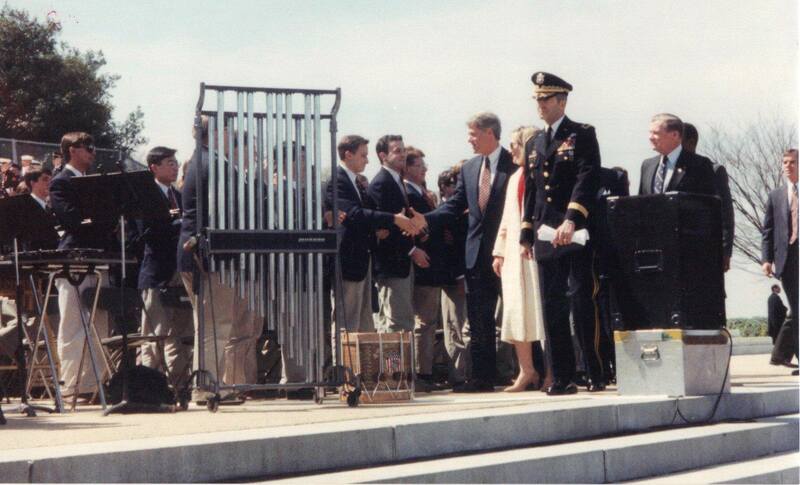 Probably the most spectacular Founder’s Day (other than 1943) was the 1993 celebration of Thomas Jefferson’s 250th Birthday. 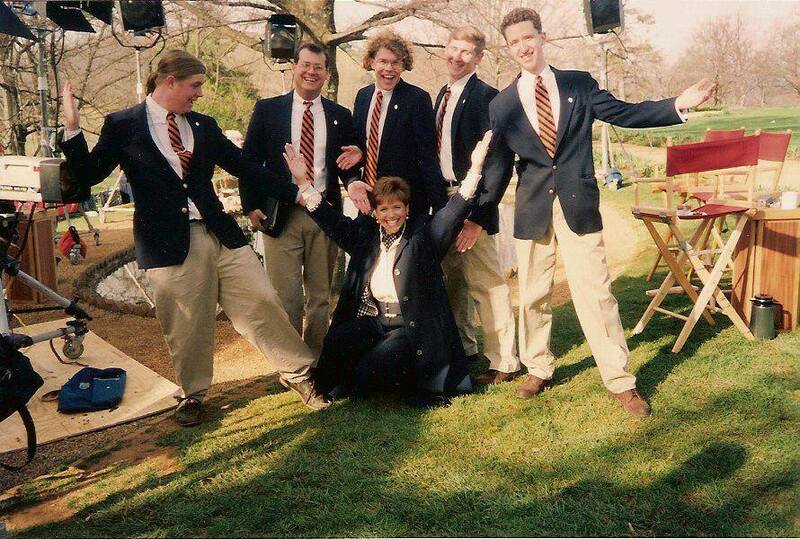 On that day the Glee Club rolled out of bed early, put on our orange and blue ties, khakis and blue blazers, and took a bus up the mountain to Monticello to join a live broadcast of the Today Show. There we stood on risers in the pre-dawn moonlight with Jefferson’s home in the background and sang several numbers from Neely Bruce’s “Young T.J.,” commissioned for the day. There was a certain amount of standing around and waiting, and at one point several of us had to make a trip to the restroom, where we found ourselves standing next to Willard Scott making awkward small talk. 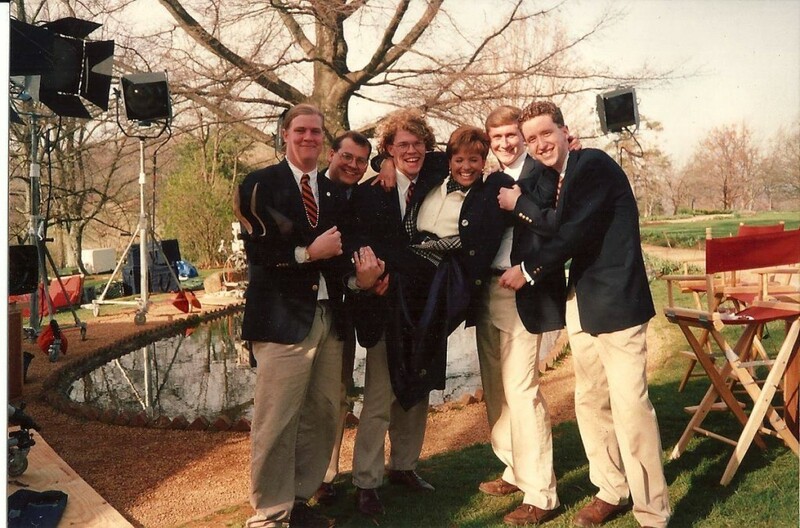 A few guys had an encounter with another Today Show personality when they met UVA alumna Katie Couric after the taping and gave her a VMHLB hat. After Monticello, everyone piled into the bus (and an overflow car) and drove like crazy. We only had two hours to get to DC and the Jefferson Memorial, where we were to sing for the President. Traffic mostly cooperated and we arrived later than planned but in time to sing in the ceremony. I’ve written about that part of the day before. We closed the day with a bus ride to Richmond, where we sang for a group of UVA donors at the Jefferson Hotel, somehow changing into our tuxedoes somewhere along the way.